First, let me preface this by stating that even though I'm very disappointed in the situation as it currently stands I'm still waiting to hear back from Yves Rocher and I would probably still order from them again as I love the perfume I ordered. Back in July 2012 I was sent various items for reviewing purposes and fell in love with their Monoi perfume. It has to be one of my top favorite perfumes and I always said it would be an item I would reorder and so I did. 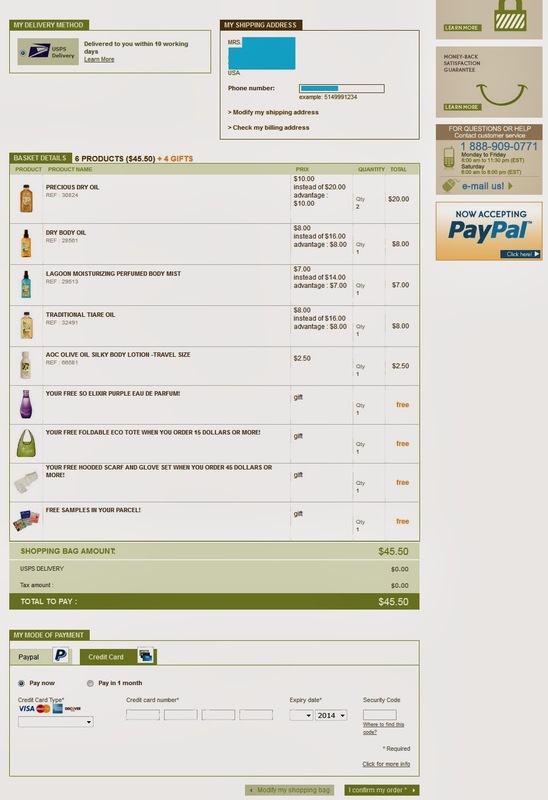 On January 1, 2014 I placed an order online at Yves Rocher USA website for a few items that were on a 40% off sale. 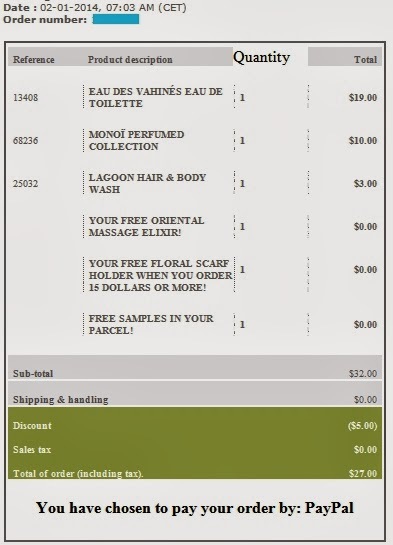 I ordered the Eau Des Vahines Eau De Toilette ($19), the Monoi Perfumed Collection* ($10.00) and the Lagoon Hair & Body Wash ($3). With my order I was to also get a bottle of their Oriental Massage Elixir and a Floral Scarf Holder as well as some free samples. In all my order came to $33 but because it was my first order I received $5 off plus there is free shipping on orders over $30. Score! In all it came to $27! Fantastic deal! Now to be fair I did place the order on January 1, 2014 which I knew that they were closed for the holidays and that my order probably wouldn't be processed until either the 2nd or the 3rd. On the 6th, which was a a Monday, I received an email from them titled, "Shipping notice for your Yves Rocher Order" on the shipping notice they included two of the items that I paid for and the two free gifts but did not include the collection. I admit I didn't notice that the collection was not being shipped out and the email did not contain any information on the $10 credit they supposedly issued me or if I was getting a refund for that $10. 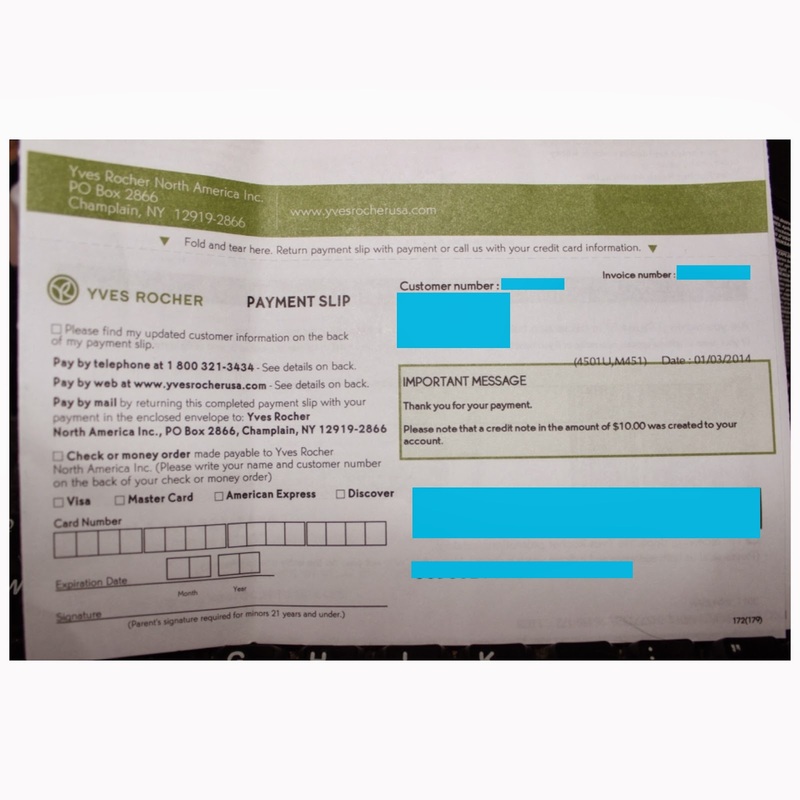 The packing slip that came in my box did indeed contain a small notice that I would be issued a $10 credit however as of January 15, 2014 there isn't a credit on my Yves Rocher account and I haven't been refunded the $10 to my Paypal account. When my package arrived I was very excited to open it since I'm essentially out of the Monoi perfume and that's what I ordered to replace the bottle I used up. I open the box and quickly realized that items were missing. In the box came the perfume, the body/hair wash, the scarf holder and the free massage oil but no monoi set and no free little samples. :( The little samples missing actually doesn't bug me too much and had my entire order came except the samples I wouldn't have given it much thought since they were free samples. I never did get an email about the set being discontinued or about the $10 credit or even an apology via email. As I said above, in the shipping email they sent to me on the 6th I did not notice that I wasn't getting the collection as I was more happy about getting the tracking #. Looking back on that email there is nothing in regards to a credit or refund. Normally with other companies where something was out of stock or discontinued I did get an email about it along with either my entire order was canceled or a refund for the amount of the item was being issued, I don't ever recall ever being given a credit in lieu of a refund. That is what bugs me the most - the lack of communication on their part about discontinued stock that they didn't have available as well as a lack of a refund. At the very least in the shipping email they should have mentioned somewhere, "Monoï Perfumed Collection - unavailable, please contact customer service for a refund or credit." I did email them about the situation since I would like at least the $10 back or the item I paid. Looking at it now, I paid more for the items individually than the set itself. The perfume on it's own was $19 and the wash was $3 which means I paid $21 for the two things individually when the set was only $10. So, now it's a waiting game to see what happens next. Edit 1: It came to my attention I misread my shipment email. She's right, they didn't include it in that email and I should have paid better attention instead of letting my frustration cloud my posting. lol However, that said, I was charged $27 not $17 and didn't get a $10 credit as the invoice stated. 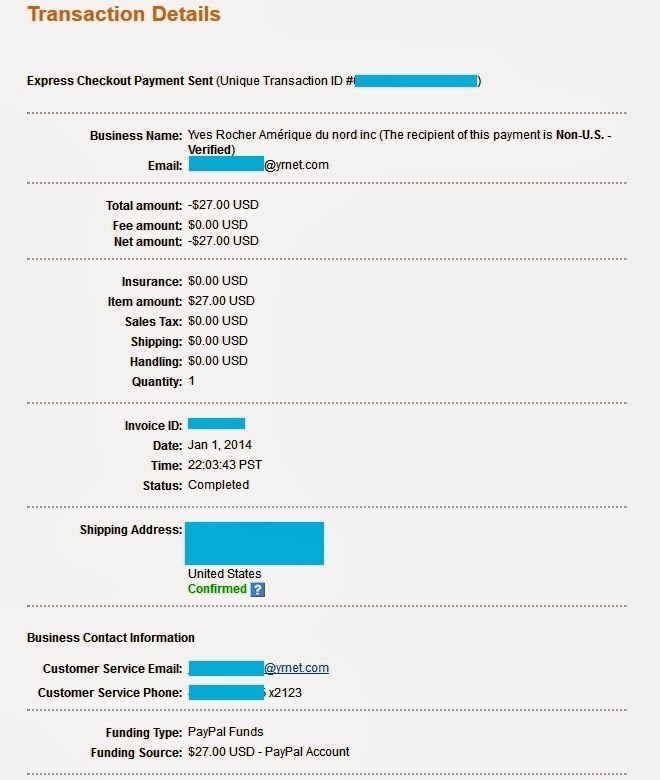 Here's the Paypal screenshot showing I paid $27 and didn't get a $10 refund as of this edit. * note the link to the collection/set is Google cached as the page now 404s. Update - January 16, 2014: I decided to call since I'm too impatient to wait for an email. The $10 credit is good only on phone orders or catalog (mail) order. I asked for a refund and was told I could only get the refund as a check or put back on my credit card - I paid via Paypal directly and not with my Paypal debit card. Such a hassle. If I can't get the refund directly in my Paypal account I have to dispute the $10 via Paypal (not the whole amount since I did get the other items). Hassle, hassle, hassle. It doesn't seem that Yves Rocher really is set up to do internet business and is more of a catalog company. Too old fashioned. "In reply to your request, we would like to inform you that we have processed a refund check in the amount of $13.00 representing the reimbursement of your credit. 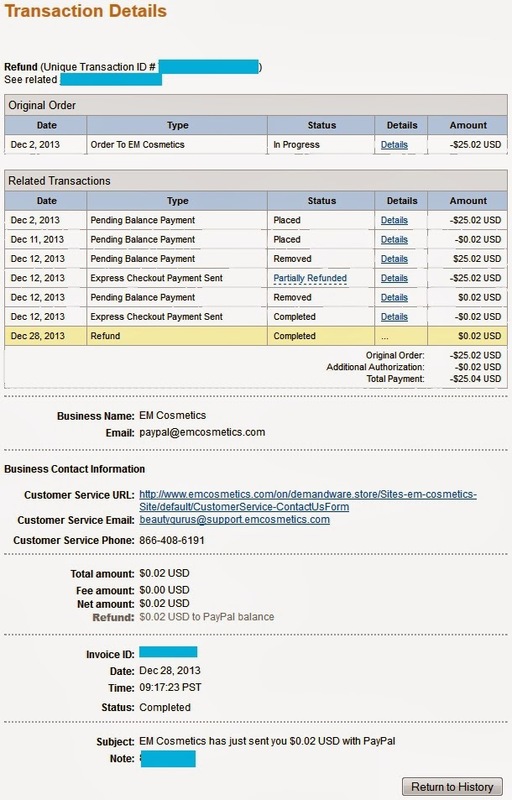 You can expect to receive your check by mail in 2 to 3 weeks." I paid via Paypal. They *immediately* took payment from my account BEFORE my order even shipped (which is fine since other companies do that as well) but they are issuing me a check? So now I have to wait two to three weeks for a check to arrive then either take it to my bank (costing me money to drive to said bank) or deposit it into my Paypal account via my app which would take another week or two for it to be deposited. I love Yves Rocher products - the bath and perfume products smell amazing and I like their cosmetics - but honestly their customer service and refunds policy is severely lacking. Customer Service should replied to my emails within 24 to 48 hours, 72 hours at most, and refunds should be issued in the same manner paid for. Paypal DOES do refunds and I paid via Paypal. I want money now not a month from now. I suppose I can continue my dispute via Paypal (I opened one up when I didn't hear back from Yves Rocher) and refuse the check as it would be within my rights to do so. So disappointed by Yves Rocher. I agree the lack of communication is terrible. But I don't see the monoi set (item 68236) on the shipping notice screen shot. 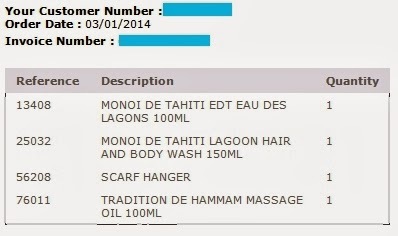 I see the perfume, body wash, free scarf hanger, and free massage oil. Also, on your packing slip it says the amount paid was only $17. So wasn't the $10 already applied? Sorry if I have misunderstood. At the very least, Yves Rocher should have sent you an email explaining that the set was no longer available. You're right, the ship notice didn't include the set. I thought it did. (Good eyes!) I looked through Paypal to see if they refunded the $10 but they didn't and I don't see a $10 credit on Yves Rocher. I'd like to know where the $10 is because I was charged $27. LOL That's what the hubby said (about the check and Paypal). I've disputed it with Paypal and have proof that they didn't send the item I paid for so they'll have no choice to refund me the $10. The $10 credit that I can *only* use if I place an order over the phone or via their mail-order catalog is ridiculous.